These activities range from simple get-to-know-each-other games through to problem solving exercises that can only be worked out by the whole group. While seemingly simple these activities can be used to illustrate how poor communication and weak leadership skills can affect performance of the group. These programs can be run in all sorts of places and often with few or no props. They can be considered a full program in their own right or as a lead-in to other activities. 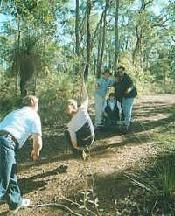 One popular program has participants separated into groups navigating and finding clues through open bushland near Margaret River. Clues are found walking on tracks as well as paddling on the Margaret River. There are individual problems to be solved to find each clue as well as an overall problem to be solved. All group members have to contribute to ensure success. This activity quickly shows any weaknesses in group process, leadership and communication skills. We also extend the concept of group cooperation and leadership to multi-day programs. These can often include the other activities such as canoeing, abseiling and caving. An example would be where a group is trying to solve a puzzle with clues scattered over a wide area requiring participants to decipher clues and retrieve parts of puzzle from locations such as on a river, down a cliff or in a cave. These sorts of programs are only really limited by your imagination. After a hard morning of team building what better place to have a chat over a gourmet lunch than at a local winery! You can leave all the transport and catering hassles for us to take care of. We can run any of the other activities such as abseiling , rock climbing, abseiling and / or adventure caving, and canoeing for your corporate group. These activities can be run with a specific group goal in mind or just to have a great time! Prices vary considerably with numbers so please contact us for a specific quote.